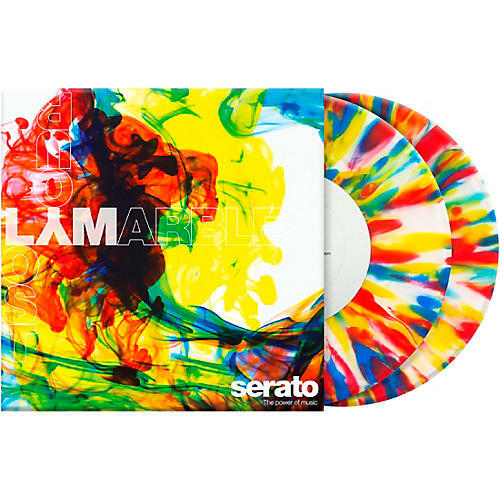 The Serato Clearly Lost Your Marbles vinyl is a colorful pair of 7" control records. It features a re-mastered Serato NoiseMap Control Tone that is 6dB louder than previous pressings. Using special polymers, Serato has given each of these white 7" records a unique pattern. They feature candy red, echo blue and canary yellow colors. The Serato Standard Colors range of control vinyl takes the place of the legacy Performance Series. The latest generation of 7” timecode control vinyl is ideal for DJs who like to practice their craft on portable turntables as well as full-sized decks. The 7" control vinyl will make traditional analog vinyl turntablists feel right at home, giving them the tactile DJing experience they know and love. The Clearly Lost Your Marbles Serato control vinyl pressing is a must-have for the avid collector and working DJ alike. Using Serato's proprietary NoiseMap control tone to let you spin your digital tracks using Serato DJ and Scratch Live, this pressing consists of two unique 7" vinyl records.